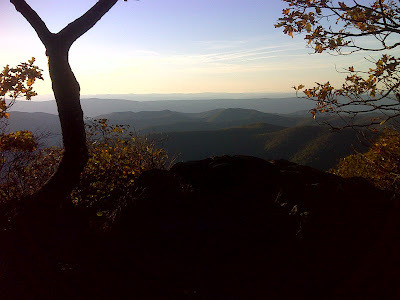 Every day I hike a little piece of Appalachian Trail both ways, first north, then back south, or vice-versa. In trail parlance, that's called a 'yo-yo' - an out-and-back hike following the same route both ways. I've been doing things that way since January 1st, and today marked the 250th such day hike. But today I further split the hike up into seven mini-yo-yo's, if you will - seven short out-and-back hikes, parking at four different access points along Skyline Drive to accomplish this. I covered 9.5 miles of new trail and hiked for about 10 1/2 hours. I got up at 7AM and changed and headed back up to the park and parked at the South Mountain Picnic Grounds and finished preparing. I was on the trail much later than I wanted to – after 8AM – and hiked the first of seven short legs, this one north to the wooded summit of Bald Face Mountain. There’s barely a view anywhere on that mountain, just a very limited one from a rock a little south of the summit. Back at the picnic area I moved to the hidden and unmarked parking area on Pocosin Fire road, hidden from view of Skyline Drive. But the parking area was almost full. I squeezed in beside a trailer that looked to be permanently parked there, and hiked a leg south back to Bald Face. On this leg, the trail takes pains (many rock steps winding up a rocky outcrop) to get you to a viewpoint on a secondary peak called Upper Pocosin that is now almost totally overgrown and doesn’t seem to have had a view of anything but adjacent mountains in the first place. Then the trail resumes its easy gentle nature the rest of the way up to Bald Face. Next I did the leg north for about a mile, turning around at an unmarked trail that runs 50 feet or less to a grassy parking area on Skyline Drive at MP 58.5. It’s clear people use this parking spot, and the access trail is clearly visible. I returned and moved my vehicle to the picnic area at Lewis Mountain Campground and hiked back north to the unmarked trail access point, which is also near a prominent big slanted rock slab beside the trail. Back to Lewis Mountain picnic area I continued on and did a leg north, stopping at Bearfence Mountain Hut. The side trail to it has been entirely rerouted – the old and very steep direct trail was closed almost exactly a year ago (was open when I visited last September), and replaced by an access trail three times longer via fire roads. From there I continued on north to the summit of Bear Fence Mountain, seemingly named for a big linear spine of high rocks that runs the length of the mountain for a quarter mile or more (acting as a ‘Bear Fence’?). This is a hugely popular day hiking destination and was crawling with people on this beautiful Saturday. But the AT avoids all the popular spots – the view point, the rock scramble and the various rock spires along the ‘Fence’. It passes beside the base of the ‘Fence’ and bypasses the summit altogether, letting a loop trail and a direct trail up from an overflowing parking area take most of the day-hiker traffic. I returned to the Lewis Mtn. picnic area and moved on to the parking area at Bootens Gap. It had only one open parking spot out of five available. I hiked back south to ascend the other side of Bear Fence Mountain, then returned and had plenty of time to hike one final leg north that took me to the summit viewpoint on Hazeltop where brother Jim and nephew Rik and I camped back in June 2009. That remains the only place that I have ever camped on the trail, and I now wish I could say I *never* camped on the trail.